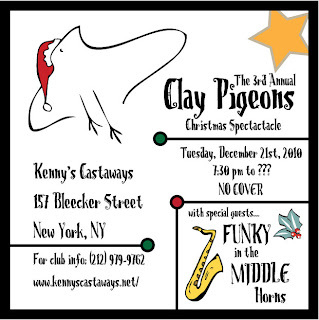 Ok Everyone, so it's the holiday season, and that means it is Clay Pigeon time. Even if this was their only show of the year (which it is) the boys always amp it up for holiday time and break out amazing songs and playing for the Christmas Extravaganza. It is going to be a hoot, an 'anny, and a blast so come on down if you are in the proper town on Tuesday night. Their Christmas tunes are not to be missed...plus their is a certain Afro'ed gentleman who will be drumming it up for a few tunes...your soul can't afford to be marked absent. Before we get there though the kind fellas at Hidden Track clued RTBE into this fantastic video from Bruce Springsteen, playing songs off The Promise for a select crowd. Give it a shot and don't skip the "Blue Christmas" closer.